Up until now when the name of Owen Davis’ 1923 Pulitzer Prize winner “Icebound” comes up, the response is likely to be a head shake that the year’s prize did not go to a more worthy candidate like Eugene O’Neill, Elmer Rice, Sidney Howard, Philip Barry or George Kelly. Now with the Metropolitan Playhouse’s revival of “Icebound,” theatergoers can see for themselves what a trenchant and engrossing drama this actually is. If anything could change the reputation and fate of this fine play, it is Alex Roe’s magnificent production, the play’s first major revival. “Icebound,” set in the same New England as O’Neill’s “Beyond the Horizon” and “Desire under the Elms,” turns melodrama into high tragedy. The performances of Olivia Killingsworth, Quinlan Corbett and Kelly King add greatly to the success of this ironic and dark tale of stony hearts and avarice in a country whose landscape is equally forbidding. Although Owen Davis (1874 – 1956) wrote 100’s of plays and screenplays, he is mostly forgotten today except as the adaptor of the stage versions of “Ethan Frome,””The Great Gatsby” and “The Good Earth” – and having won the Pulitzer Prize in Drama for 1923 between O’Neill’s “Anna Christie” and Howard’s “They KnewWhat They Wanted.” Like Sinclair Lewis’ 1920 “Main Street” which satirizedprovincial small town America, “Icebound” condemns what has happened to the Puritan work ethic – turning it into greed, jealousy and sanctimoniousness. In its own way, “Icebound” is a scathing attack on an America that has lost its way, circa 1923. 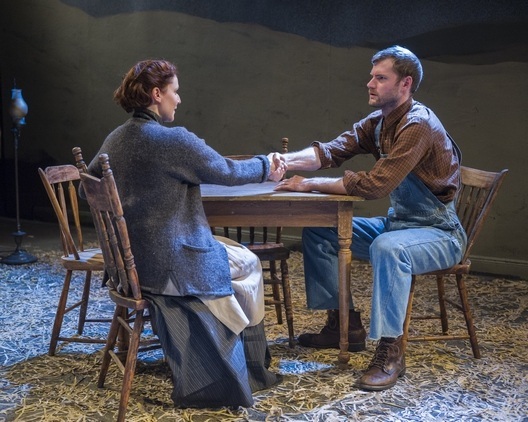 The play is set in the Jordan homestead and farm in the small town of Veazie, Maine. The matriarch, a cold, unloving woman, has been cared for by 23-year-old Jane Crosby, a second cousin, who has never complained of the work while Mrs. Jordan’s real children have only visited her to borrow money. While the family sits in the parlor waiting to see how much they will receive on her death, the prodigal son Ben, on the run from the police, arrives and is told he is not welcome. However, it appears that Jane has been left the Jordan fortune and makes bail for Ben so that he can help her work the farm, to the disgust of his self-righteous brother and sisters. Not content with their contempt of the wholesome, hardworking Jane, the Jordan children (storekeeper Henry, his widowed sister Sadie who can’t make her rent but doesn’t work, and spinster Ella who makes hats for a meager living, as well as Henry’s step-daughter, the shallow Nettie) come looking for handouts. However, Jane who has been secretly in love with Ben plans to teach him self-respect and a trade and to safeguard the Jordan fortune from the family who would run through it in a remarkably short time. And then Nettie decides to make a play for Ben and make him forget his obligations, while the judge who has helped Jane all along declares his love for her. Described as baldly as this, “Icebound” sounds much more melodramatic than it actually is, the plot worthy of an O’Neill tragedy. The title does not refer to the bleak Maine winter landscape (which it resembles) but the hardhearted and uncaring Jordans: as Ben says after he has lived under Jane’s rule for two months, “Sometimes somebody sort of laughs, and it scares you; seems like laughter needs the sun, same as flowers do. Icebound, that’s what we are, all of us, inside and out.” The sets (designed by director Roe) perfectly reflect the life style of the characters: drab, dull, clean, but stripped of all of life’s color and beauty, reduced to a subsistence wage by choice and temperament, not necessity. The play is also extremely funny and lively in its depiction of greed and envy carried to the highest degree. The characters are extremely well drawn and the play has enough twists and turns to make its unrelieved atmosphere easy to sit through. Aside from Roe’ fine, realistic direction, he has also worked with his cast to create three-dimensional characters out of people who in lesser hands could easily deteriorate into stereotypes. At the play’s center is Olivia Killingsworth’s Jane Crosby, the despised step-cousin (once removed)who is the salt of the earth. Her spare, unadorned character who has no time to mince words grounds the play with a solid rock foundation. Under her brusque, business-like exterior is a heart overflowing with love for those who deserve it. As the Jordan clan, each actor has made his or her role entirely different from the others: Kelly King’s oldest son, the sanctimonious Henry always ready with a quote from the Bible to put someone else down; Maria Silverman as his socialclimbing wife Emma quick to find slights; Alyssa Simon as the widowed sister Sadie, a sour-faced woman who spies on her neighbors and traffics in gossip that is not necessarily backed up by evidence; and Anne Bates’ youngest sister Ella who at 40 and an old maid has becomeembittered and envious of everyone else who she thinks is having a better time. Quinlan Corbett makes Ben the sulky, brooding, black sheep, arrogant and dissipated, someone you would hardly think worth rehabilitating except for Jane’s faith in him. As Emma’s daughter Nettie, Michelle Geisler is flirtatious, vain, spoiled and selfish, a perfect example what happens when a child is denied nothing throughout her formative years. Among the authority figures, Victor Barranca’s avuncular Doctor Curtis and Rob Skolits’ distinguished and reserved Judge Bradford give able support. In the small role of the maid Hannah, Sidney Fortner, also responsible for the plain costumes which perfectly define these characters, makes the most of her few pointed remarks. Metropolitan Playhouse’s mission is to “perform plays from American’s literary past, plays based on American history,” as well as “plays … that resonate with those core works.”In rediscovering Owen Davis’ “Icebound” and giving it such a superb production, it has lived up to its mission to remain faithful to restoring worthy works of the American legacy. One more lost classic has been exhumed from the library shelves. Original play which led to the famous screwball classic of the 1930’s turns out to be a drawing room comedy instead.